While Meta Box also works with PHP 5.2 and older versions of WordPress, these versions have reached official End Of Life and as such may expose your site to security vulnerabilities. The Meta Box plugin is available on wordpress.org. To install it, go to Plugins → Add New and search for Meta Box. Then click the button Install to install it. After that, click the button Activate to activate the plugin. After installing Meta Box, you won’t see anything in the WordPress admin area. The plugin doesn’t have any admin page for configuration or settings. Instead of that, it provides an API that you can use to speed up the process of creating meta boxes and custom fields. 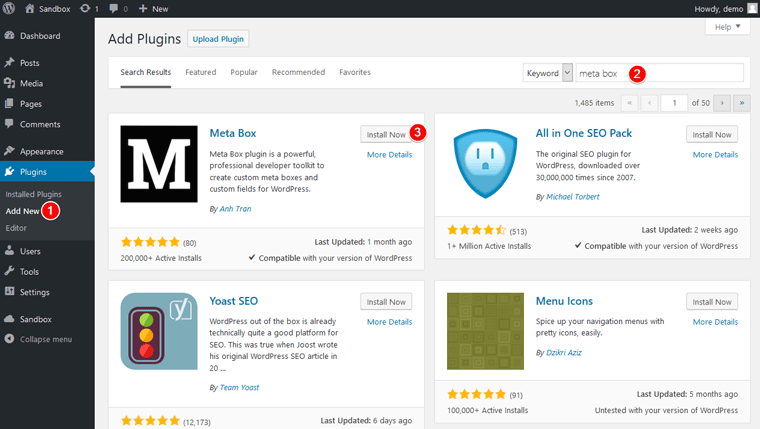 To get started using the plugin, please see the Quick Start guide.